The Centre for Languages here at City University London runs a large scale language diagnostics programme every September in order to assess the levels of students wishing to study a language. 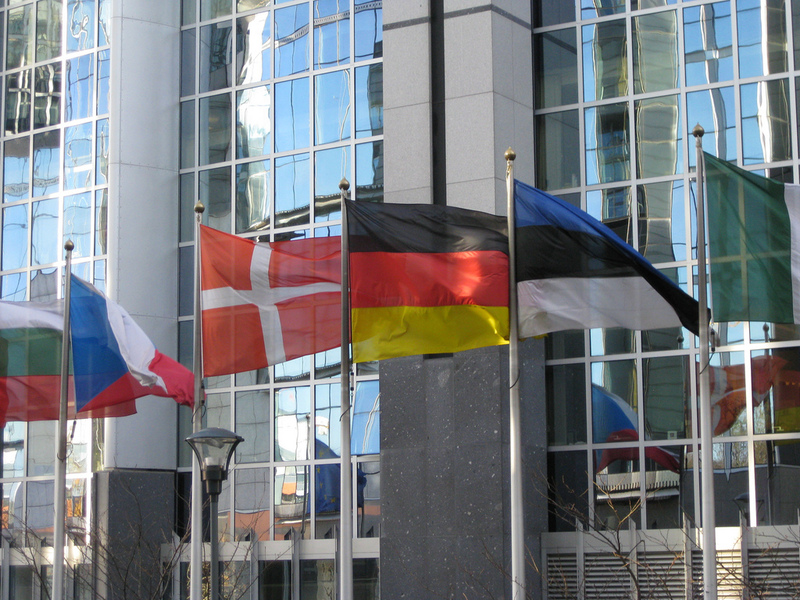 The languages that we offer are Arabic, French, German, Mandarin and Spanish. 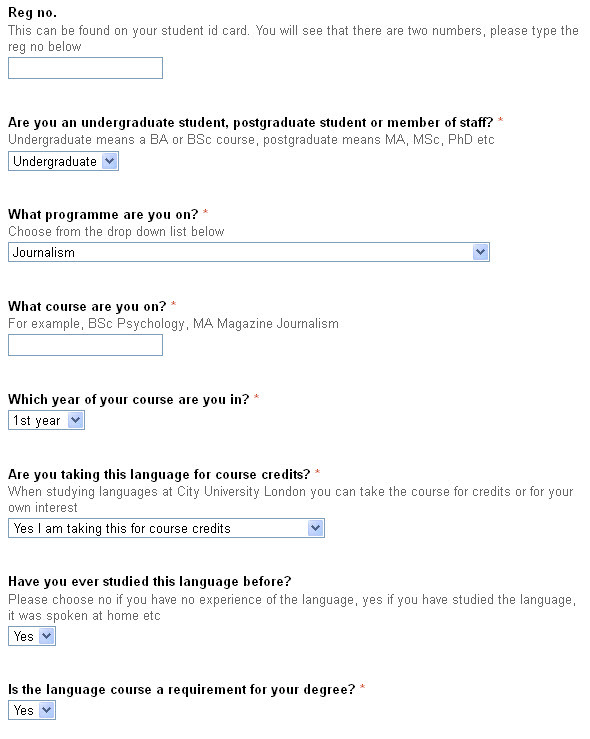 Students can take a language as an optional module or as part of their course in some cases. Previously students have taken the test on paper, the paper has been marked and passed on to administration for them to assign the student their level and send out their timetable. This was a time consuming process for academics and administrators alike and caused delay in assigning students to the correct language level. Isabelle Marcoul, Head of the Centre for Language Studies at City University London, contacted me to see how this process could be enhanced through the use of Moodle. After numerous meetings and discussion with those involved it was agreed that the current tests would be put online as a Moodle quiz. This meant that students could get their result immediately and know which level they were and which class they could attend. Students also completed an online form (which had been set up using googleforms) to collect the information that was needed by administration. This process was implemented for the first time in September 2011. Below are the thoughts of the Exams and Assessment Coordinator, the School Registrar and myself from Educational Technology, about how the project went and improvements we will make for next year. This year you used Moodle’s quiz function to run your language diagnostic tests. Why did you decide to do this? We decided to use it because the previous system seemed out-dated, ineffective, required a lot of resources and storage space. Also, it was hard work in terms of marking, administration and organisation. How did you administer the tests in previous years? We had an A3 (folded into A4, so there were four pages) paper-based test with multiple choice questions (two pages) and a writing section (one page). Student’s details (name, email address, studies etc.) had to be filled in on the front page of the test. Tests were given out to students in Fresher’s Week – at the annual Languages Fair for the Languages for General Purposes (LGP) students and at orientation meetings at CASS and SoA/ SoSS for the Language for Specific Purposes (LSP) students. The multiple choice section could to be marked using transparencies, whereas the writing section had to be looked at by a lecturer of the target language. The marked tests were passed on to the administration and the students’ details were entered manually onto the registers. Once this had been done, students were sent an email with the course information. What are the advantages of running the tests in Moodle? We don’t have to mark the test anymore, the mark is calculated automatically. This saves a lot of time. Staff at the Languages Fair can concentrate on giving advice regarding the courses rather than marking piles of tests. The result of the test comes up immediately once it has been completed. If students are briefed properly, they know straight after taking the test if they a have been admitted to a course and which class they should to go to. From an administrative point of view, running the test on Moodle is a lot more effective and less time-consuming. 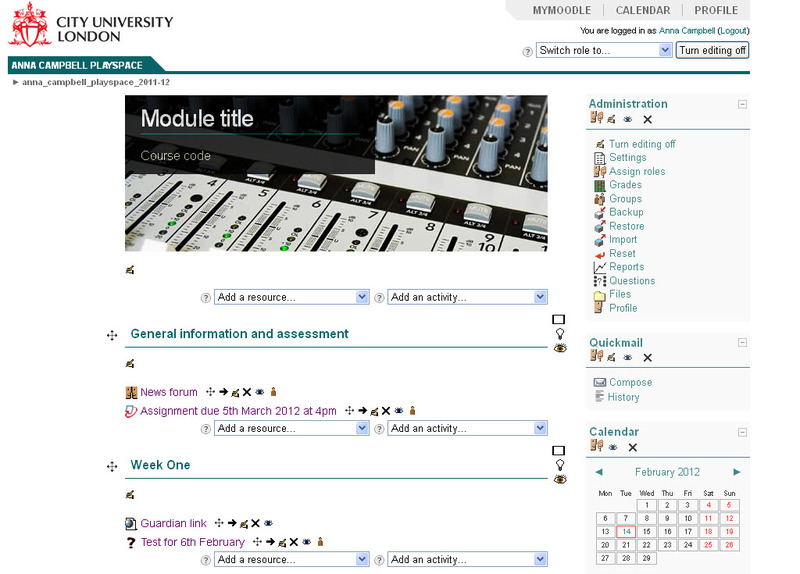 Students enter their details onto Moodle which can be easily exported, no need to enter data manually. Also, data are accessible to anyone in the languages team and test results/ students’ details can be looked up easily without having to communicate with the administrator. In principle students can do the assessment test at home or anywhere at the university, without having to pick a copy up/ drop it off at the CfLS. Students who were not able to attend the Language Fair are now sent the details on Moodle along with an advice sheet. This makes it a lot easier for latecomers to take the test and enrol on the course which had a positive impact on enrolment numbers. Overall, the new system is a lot more reliable and effective than what we had before. Are there any disadvantages? How did you solve these? The only downside really is that we need rooms equipped with computers at the Language Fair and we depend on IT services doing their job properly. For peak times at the Language Fair, we had booked several computer labs across the university. We had to make sure that one support person was present in each of these rooms and that plenty of advice sheets on how to access the test were available. This was important because students are not necessarily as confident with the technology as one assumes. Have you had any feedback from staff or students? Our staff was extremely happy with the change. Apart from all the positive factors mentioned above, there is also the feeling that we have arrived in the 21st century with our assessment methods. The paper-based copy had become a little embarrassing. Students appreciated the flexibility of the test as you can start completing it and resume later. The only problem we had, had nothing to do with the technical side but concerned the content of the French test and can easily be corrected. Will you use the Moodle quiz again next year? If so, what changes would you make? Yes, we certainly will use it again. It would actually be a nightmare to go back to the paper-based copy. The only change we will make is that we will ask LGP students to self-enrol (through Moodle) on the course. This will even further simplify the administrative process. I am extremely grateful to Anna Campbell who made the project possible. Anna understood all our needs and made sure that they were met in the best possible fashion. Moreover, she had extremely useful ideas and suggestions we had not thought of before. She made the technology accessible to us and offered excellent training to the lecturers designing the tests. All those who were less confident with the technology received individual support from her through email/ over the phone after the training. It was very easy to communicate with her. She also offered hands-on support for the Language Fair which was very re-assuring for me on the day. How did the change in process impact on administration? Moodle revolutionised the way we administered the language placement tests. It made what was a 3-4 day job (over the weekend!) a single days work (not on a weekend!). No more data entry or marking tests by hand, Moodle sorted all that out for us and left me the much more manageable task of filtering the spreadsheets and emailing students with their group allocations. Next year, I would want to move the parts that go on Google docs to excel spreadsheets downloaded from Moodle as not all of the team working on the data had access to this information or necessarily felt comfortable with Google docs. And where we’ve got two documents that collect the information, I would aim to make it just a single downloadable spreadsheet. In addition to these small changes I would also introduce passwords on the free LGP courses to enable tutors to give these out in class so students are able to register themselves. How do you feel the project went? I’m really pleased with the way the project went this September. It was great to be able to see a tangible benefit to using Moodle in this way for all involved. I also am pleased that the staff teaching the various languages really got to grips with using Moodle quiz and therefore started to see the further benefits of using Moodle. We had to set up the Moodle module that the tests were in as self enrol. We don’t tend to do that at City, we normally enrol students onto modules via SITS but in this case the whole of the university and staff could take the tests and that was not feasible. What improvements will you make? I think that Simon and Svenja have covered them. There is an issue of the Moodle quiz result in the gradebook and being able to match it up with the personal information on the form. I haven’t figured out an easy way to match those two up (apart from getting students to enter the grade they got in their test onto the googleform which is not foolproof). I’m still thinking about that! We’re starting a series of Moodle tips for staff (for Moodle 1.9 for those reading this outside of City University London). Every module has a header image at the top of the page. Usually this is one that we have assigned to you. If you have a more appropriate header image please do email it to esthelp@city.ac.uk with your module code. Please note that images that need to be approximately 800 x 200 pixels and available under creative commons licence. Alternatively you could send us a photo that you took.